First turkey of the year is about to go on the BBQ. With the lid on it acts like an oven and over 6 ~ 7 hours will cook the 18lb bird we ordered. 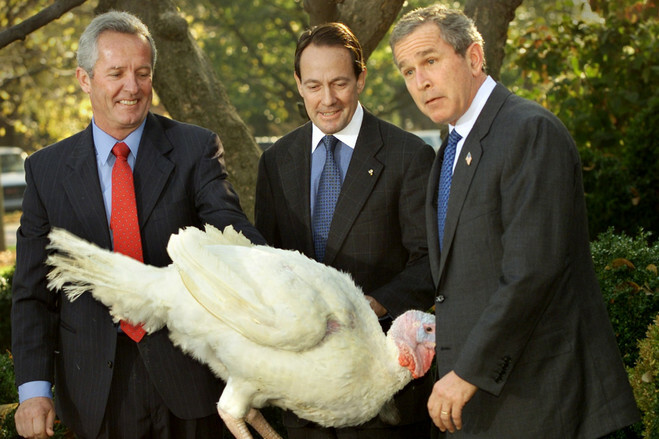 The difficulty in Japan is actually procuring the turkey in the first place. These days it's relatively straight forward in Tokyo but once outside the city it becomes near impossible. I was once in a store about two hours into the mountains and asked if I could order an 8kg (18lb) one and listened as everyone behind the counter discussed what I was looking for and came to the conclusion I'd got it wrong and really wanted an 800gm (2lb) bird. It took about half an hour to convince everyone I knew what I was looking for and only then did they say they didn't have one. There is an alternative though if you're open to different approaches to Thanksgiving or Christmas. Wild boar (inoshishi) is available at this time of year and can be cooked over the fire for several hours to bring around that family feeling. Wild boar though is a little tough to eat and so Japan has solved the problem by breeding inobutta - wild pig. Delicious and available in the mountains where the turkeys don't roam.